Well of course we couldn’t go alllllll the way to Hawaii AND make the trek to the Big Island and NOT go to the Kona Brewing Company. I mean, that would be nearly as sacrilegious as skipping out on the coffee plantation tour. Besides, we all love beer–especially Tracy and I (okay, not April–she only likes, on exceedingly rare occasions, scotch). It’s our (Tracy & my) thing. For example this year I got him a home brewing kit for his birthday. At this point, I’m sure Christi wants to kill us both. Don’t bother writing in to defend her–she’s already told me as much (which is EXACTLY why I forgot to mention to her what I sending for his present!). Point being that we couldn’t miss out on an opportunity to imbibe in some delicious Hawaiian beer–and tasty food to boot (get the fish tacos!)! Of course as soon as we sat down and opened the menu, we realized that our biggest problem was going to be narrowing down our beer choices. With so many beers on the menu, we knew that we had only one option: the sampler. And by “the sampler” I mean we got two samplers because we wanted to try as many as possible–besides we were all sharing (aside from April). Also a great time to make a public service announcement: if you think you might want to write about something in the future TAKE NOTES. Because I distinctly remember thinking “these are so fabulous, I won’t forget….” and then here I am frantically trying to remember (although some might point out that if I had written about this a little closer to the trip, it might not have been an issue). We all tasted and compared and tasted and discussed and tasted and swapped glasses around and tasted and bartered to finish off our favorites. In the end–because we couldn’t just sample the beer, we had to also drink it!–I chose the Wailua Wheat, hoping that the fruity wheat beer would pair nicely with my fish tacos (it did!). What I enjoyed about the first three is how smooth they were. The porter tasted like silk and coffee and it was magical. The only reason I didn’t get a pint of it was because after two samplers, I was starting to get full and I need to save room for a pint + tacos! Plus it would have totally overpowered the tacos. The Lemongrass Lu’au was interesting. It was crisp and clean and the ginger and lemongrass added a very different flavor profile. I’m very glad we tried it, however, I don’t know that I could have finished a pint of it. Yes, I deliberately left a lot of space before the Koko Brown. I disliked it immensely. Now before you start yelling and screaming at me, I fully and proudly admit that I am biased. I HATE BROWN ALES. Based on the other beers we tasted, I’m sure it’s a good brown ale–I just hate them. So if you’re one of those weird people (I’m not judging…much) who enjoy brown ales, pleeeeeeeease don’t let my dislike stop you from trying it. 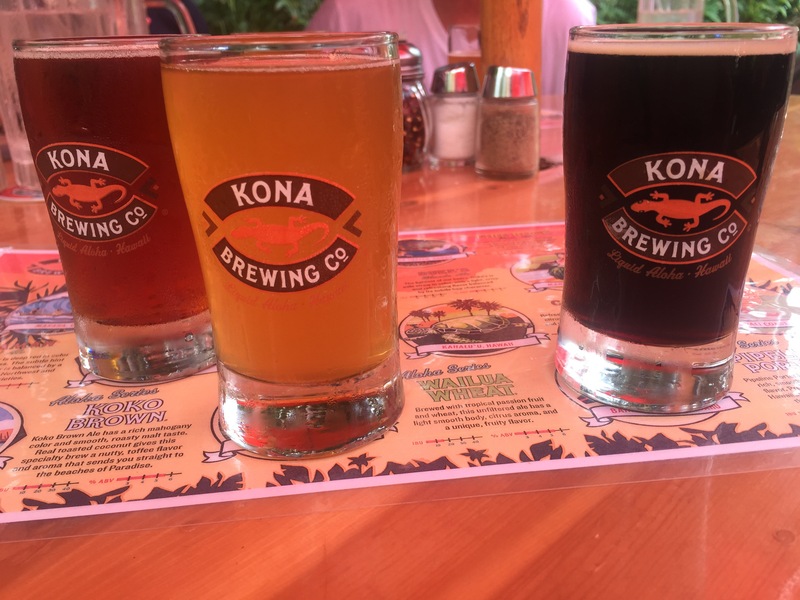 All in all, we had (at least I had) such a great time and if you enjoy beer, the Kona Brewing Company should absolutely be on your list of things to do in Hawaii!